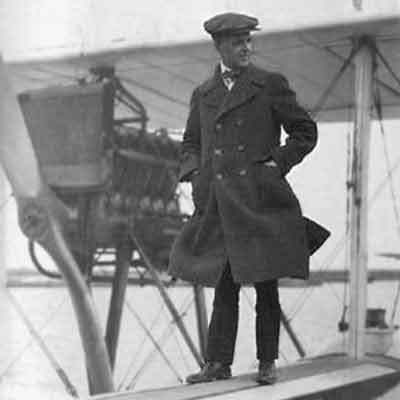 Inglis Moore Uppercu, (1877-1944) not only owned one of the country’s largest Cadillac distributorships, he was also one of America’s aviation pioneers. Born in North Evanston, Illinois, on September 17, 1877, he moved to New York City in 1888. After attending the Polytechnic School of Brooklyn, he studied law at Columbia University before embarking on a career in the automobile industry. After brief stints with the Duryea Automobile Co. and the Neostyle Co., he established the Motor Car Co. of New Jersey in 1902, where he sold Autocars, Cadillacs and Packards to residents of the metropolitan New York City area. 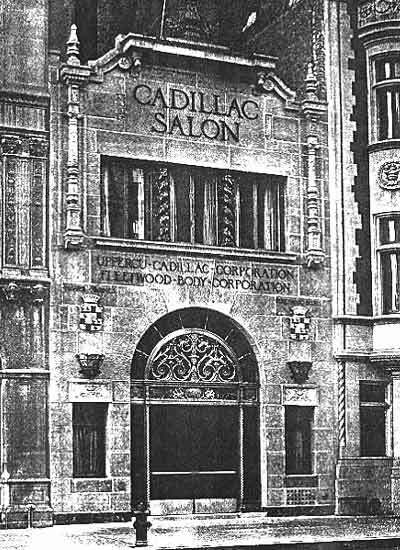 With a proven track record, he bought out the New York City Cadillac dealer in 1908, and reorganized as the Detroit Cadillac Motor Car Co. Early on Healey & Co. developed a good working relationship with Uppercu, and by the middle teens, he was Healey’s largest customer. J.R. McLauchlen was manager of Uppercu’s custom body department and both he and Grover C. Parvis, who held the same position with New York City’s Packard distributor, often designed the bodies they ordered. For example, McLauchlen is credited as the designer of a Cadillac Type 61 woodie built by Healey in 1921. Many Healey-built Cadillacs were town cars and limousines, many of which featured Rolls-Royce style radiators designed to disguise the chassis true identity. During 1908 Uppercu made an investment in the Boland Aeroplane and Motor Co. of Keyport, New Jersey, eventually becoming its president and chairman when its founder, Frank E. Boland, died in a 1913 aviation accident. 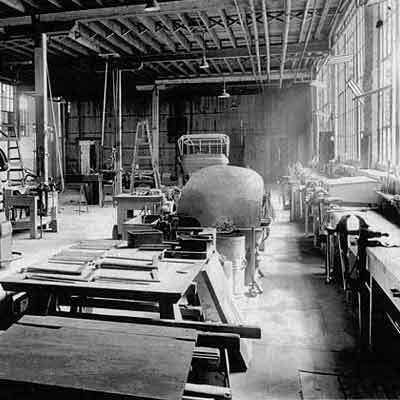 Uppercu reorganized the firm in 1914, renaming it the Aeromarine Plane and Motor Co.
On the strength of orders from the US Army and Navy, a new factory was constructed in 1917 adjacent to Raritan Bay in Keyport, New Jersey. During World War I, Aeromarine made observation planes for the Army Signal Corps and trainers for the Navy. When the war ended, the US military was stuck with $4 million worth of surplus aircraft which were offered to Uppercu for pennies on the dollar. Uppercu had no problem unloading them to the era’s infamous rum runners and barnstormers, and kept a number of Curtiss F5L and Curtiss HS2L flying boats which he converted into luxurious civilian airliners. An Aeromarine flying boat made the first at-sea Air Mail delivery in 1919, when it dropped a bag of mail on the deck of the White Star Line’s Adriatic. In 1919, using the Hudson River mooring berth for Uppercu's yacht, the Seven Seas, Uppercu began offering sightseeing tours of New York City in a few of the renovated Curtiss flying boats. 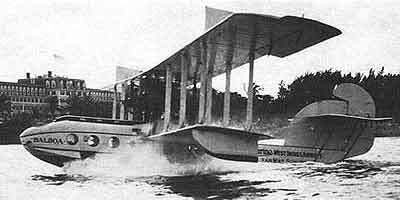 Soon after, Uppercu bought an existing Key West, Florida flying boat operator and formed the Aeromarine West Indies Airways, an Aeromarine subsidiary serving commercial passenger and mail routes in the Caribbean. The firm was reorganized as Aeromarine Airways and within the year, scheduled service commenced between Key West, Havana, Miami, Palm Beach, Bimini and Nassau. During the summer, some of Aeromarine’s flying boats moved northward, offering sightseeing tours and schedules flights between Manhattan, Atlantic City and the Hamptons. A westward route to Cleveland and Detroit was added, as was a direct flight from Manhattan to Havana which was affectionately called “the Highball Express," by its Prohibition-Era passengers. Aeromarine established ticket offices in Cleveland, Detroit, and Miami, and operated air terminals at Key West and New York City, where it was located on the Hudson River adjacent to the Columbia Yacht Club at 82nd Street. New York's Healey & Co. furnished Aeromarine with bus bodies for the Packard and Cadillac-chassised vehicles that shuttled passengers between the firm’s ticket offices, airfields and mooring berths. 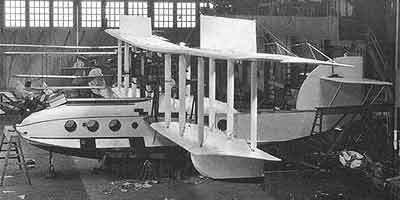 Due to constant exposure to sea water, the Curtiss aircraft’s wooden hulls aged prematurely, and Aeromarine Plane and Motor Company introduced an all-aluminum flying boat in 1923. Unfortunately the Navy wasn’t in the market for any new boats and the craft’s high price-tag made it too expensive for most civilian carriers. Unfortunately Aeromarine’s excellent safety record was shattered in January 1923 when an engine failed on one of their Curtiss airliners between Key West and Havana. 4 wealthy Cuban nationals were killed and the resulting bad publicity forced the once-promising enterprise into bankruptcy. What remained of Aeromarine Airways was sold in January 1924 and Uppercu formed a new firm with aircraft designer, Vincent Burnelli, called the Uppercu-Burnelli Airplane Co.
Healey & Co.’s last Salon appearance was at the 1923 New York Salon, and soon afterwards Colonel Healey decided to retire from the body building business and sold it to Uppercu, his largest customer. Uppercu relocated Healey’s bus building operations to Aeromarine’s Keyport, New Jersey factory and reorganized the firm in 1924 as the Healey-Aeromarine Bus Co. with headquarters in Nutley, New Jersey. What remained of Healey’s custom automobile body business was integrated into Uppercu’s Detroit Cadillac Motor Car Co. which was reorganized as Uppercu Cadillac Corp in 1925. By that time Uppercu operated two Manhattan dealerships, the first at Broadway and 62nd St. the second at 70 Columbus Ave.
Healy-Aeromarine Bus Co. operated at least through 1926, and was also known to have built some professional cars on Cadillac & Packard chassis, but by 1928, the firm was known as the Aeromarine Starter Corp., so further manufacture of buses or hearses is doubtful. Inglis M. Uppercu is personally responsible for the survival of the original prototype 1893 Duryea automobile that can be seen at the Smithsonian Institution. Brothers Charles and Frank Duryea built the first gasoline powered car in America in 1893 out of an old horse-drawn buggy into which a 4-hp, single cylinder gasoline engine was installed. It didn’t run very well and was only driven a couple of times before the brothers put it into storage and forgot about it. In 1920, Uppercu discovered the whereabouts of the vehicle, and realizing its importance, purchased it, and donated it to the United States National Museum, which is now called the Smithsonian Institution. In 1931, Uppercu sold Cadillac dealership group to General Motors’ Cadillac Motor Car Division, and retired from the automobile business to spend more time on his yacht, the full-rigged clipper, Seven Seas. However, he continued to dabble in the aviation business (1929 -Cadillac Aircraft Corp.) until 1936 and remained active overseeing his vast holdings in the mining and exploration business until 1938. Now a millionaire, several times over, he retired to New York City and passed away on April 7, 1944. He was survived by his wife, the former Ella Krueger, and five daughters.